We both started our careers in architecture. It was on a whim that the two of us decided to stop with architecture, and eventually opened our store Belgikïe in December 2013. Two years later, we launched our own line of t-shirts, accessories and jewellery to satisfy our creative desires. And just this April, we created the virtual marketplace BelTik, bringing together local craftsmen and creators. 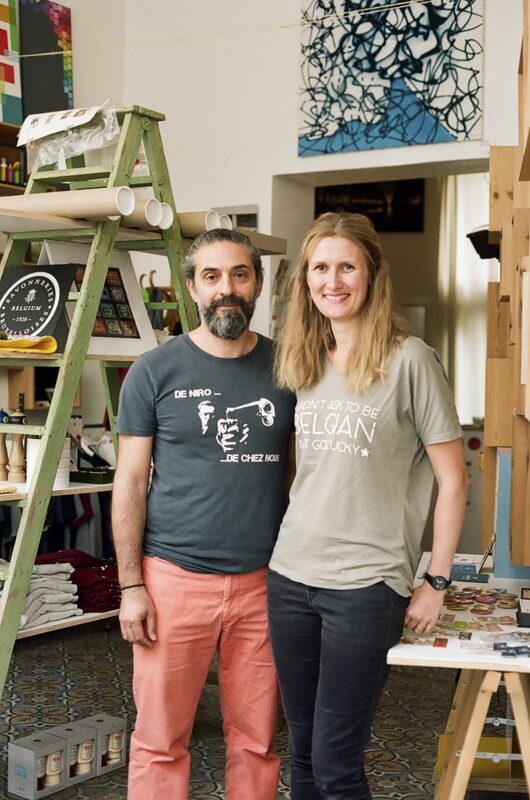 Cool, relaxed and always smiling, because we get to do what we love – even if being a trader in Brussels and making a living through selling local products is extremely tough. Having gone all the way in what we believe in, creating an ethical store and stepping out of our comfort zone. Our self-deprecation, surrealism and humility. Brel, Merckx, and Poolvoerde, because the French will envy us forever! Flagey, where you can easily find great beer, comics, fries. A true representation of Brussels’ multiculturalism. Dallas et andalouse – but if it’s served in a cone, then it’s got to be a messy dollop of mayonnaise. The Dallas of course, at Stam, the bar right by our boutique store. How do you find a Belgian in a submarine? Look for the one with a parachute. It’s not that Belgians do it better than others, but rather that the others do it less well.